Your eyes are said to be “the windows to your soul”. The eyes are one of the first areas to show the visible signs of ageing. Those tiny little lines at the corner of the eyes will progress to deeper lines if the delicate eye area isn’t treated both in the Studio and at home. Yes, moisturising your face will give your eyes some hydrating benefits, but that just isn’t enough to prevent the eyes ageing forming deeper lines and dark circles. For a start, the skin around the eyes is up to 10 times thinner than on the rest of your face, ageing them up to 30% faster. We all blink, cry, squint, which does take its toll if we do not protect them with the correct ingredients to keep free from crow’s feet. If your eyes are starting to give you concern, I recommend the Oxygen “Smooth Eyes” treatment in the Studio, to visibly plump and firm the delicate skin around the eyes. 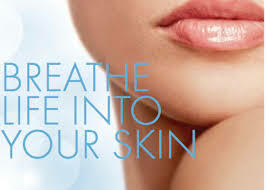 This is always included when you book any Crystal Clear Oxygen Facial. Your prescribed eye cream should be applied twice daily for optimum results. Apply your cream, by taking a pea-sized amount for both eyes onto your ring finger. Pat and smooth the cream, working it from the corners to the outside of the eye, and just under your brow bone, again from the inside outwards.